A montage of still images shot and elaborated by means of her signature technique of using Polaroid formats with outdated and degraded film stock in natural light, with the resulting images re-photographed (by other means) enlarged and printed in such a way as to generate further distortions of the image. 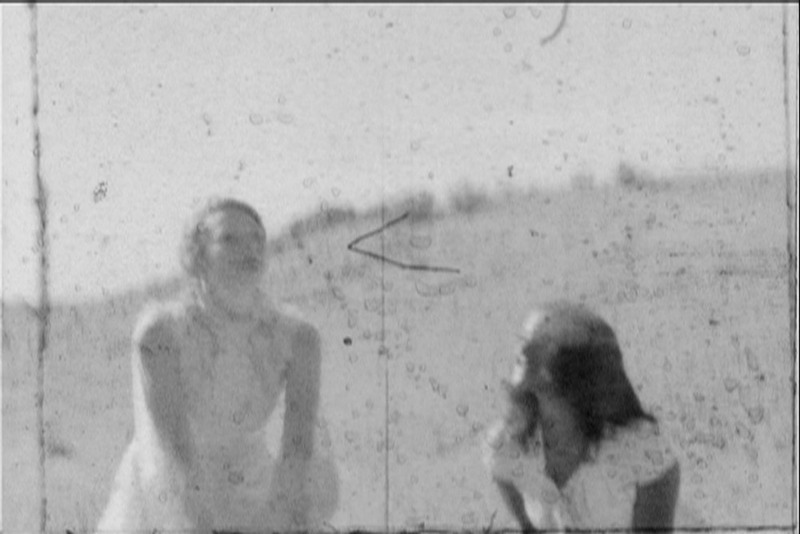 Dated Super 8 film footage without a sound track and developed by the artist. Recorded off-screen narration of texts written by the actors or photographic subjects, and selected by the artist. At the outset, this method presupposes a tension between still and moving image; between the conventions about the juxtaposition of such images in a moving image presentation; and, and a further tension between the work’s juxtaposition of sound and image, and the conventional relationship between sound and image that occurs in the majority of films. But Till Death Do Us Part also conduces to an implied synthesis of still and moving image by the manner in which the artist edits or cuts the work. First, she imposes a rigorous criterion of selection, whether to render a section as a still or moving image. The predominance of still images is neither an arbitrary residue of her background as a still photographer—in fact she has years of background in film projects; nor is it a capricious reaction against moving picture convention that demands more moving images than stills. Instead, the number of still images has a direct thematic relation to the fabric of the love story in the following sense. Stills, by definition, have a very different relationship to time than do moving images. The unedited moving shot occurs in real time, and the edited moving shot, despite its artificial rendering of time, all too often affords the viewer an even greater illusion of experiencing reality as it unfolds. It is self-evident that moving images overtly mimic the temporal dynamic of reality. Frozen in time—at least overtly—still photographic images pose a radical tension with real time. This tension is all the more heightened by their “real” content, by the recording aspect of their constitution. But precisely because they seem to suspend time, they more naturally evoke a sense of the past and of its inherent nostalgia. In this way, they are often more readily evocative of other states of experience of the real, if we properly include in the real our own experience of the past through memory, and its inherent emotions. This attribute of stills is the real criterion of their selection in Till Death Do Us Part where consistently, the artist associates them with desire, dream, memory, passion, and the ensemble of mental states that accompany a love relationship in its nascent, mature, and declining aspects. It is noteworthy that, after a transition from a still image to a moving image, as soon as the viewer expects the movement to continue, there is a “logical” cut that we expect to result in another moving image, not only because of its mise en scène, but also because of its implicit respect of traditional rules of film editing, its planarity, its sight line, its treatment of 3D space—all these lead us to expect that the successive shot, as it is revealed, is bound to be another moving image. But contrary to our expectation, and in delayed reaction, we are startled to find that it is another still image. One effect of this technique is to reinforce the tension between still and moving image by means of surprise. But in another sense, the technique reminds us that, in film, the moving image is also a succession of stills that only generate an illusion of movement. Although it is a fact that here the artist employs Super 8 footage, in principle, even were the moving images shot with video, the fact would remain since video images are all reducible to a series of discrete still images no matter how “seamless” the transitions between them. Yet a third effect of the technique has to do with its temporal implication. Often art aspires to conflate or otherwise distort time. Here, instead, the juxtaposition poses a tension between two times: the “real time” of the moving image that is by definition associated with reality in its temporal aspect; and the “frozen time” of the still image associated with an altered sense of time in memory and fantasy of the object of desire—not to mention the unreal time of the sense of the monopolization of the gaze conventionally attributed to the photographic medium, but which here is associated as much with the yearning narrator as it is with the viewer. B) the background of reflective effects of reality, such as dream, memory, fantasy, and their inherent compounding of past and present emotions. In addition, the piece advances in the direction of a Gesamtkunstwerk, but in a way that reconsiders this synaesthesia as a unified complex of genres—not only because it uses new media that did not exist when the idea was first enunciated in Wagner’s time, but also because it comprises elements that are not entirely of one artist's making, but which are subsumed by the work overall. The totality remains the vision of one artist. In this sense, Till Death Do Us Part reveals a further tension between the central intelligence of the artist and the products of other individual participants. This tension is compounded to the degree that the characters’ attributes and narrated statements are part fiction and part reality, part themselves, and part their characters. But Stefanie Schneider is the one who assembles, organizes, and selects them all. This selective aspect of the work is an expansion of idea of the act of photography in which the artistic photographer selects that which is already there, and then, by distortion, definition or delimitation, compositional and lighting emphasis, and by a host of other techniques, subsumes that which is already there to transform it into an image of the artist's contrivance, one that is no less of the artist's making than a work in any other medium, but which is distinct from many traditional media (such as painting) in that it retains an evocation of the tension between what is already there and what is of the artist's making. Should it fail to achieve this, it remains, to that degree, mere illustration to which aesthetic technique has been applied with greater or lesser skill. The way Till Death Do Us Part expands this basic principle of the photographic act, is to apply it to further existing elements, and, similarly, to transform them. These additional existing elements include written or improvised pieces narrated by their authors in a way that shifts between their own identities and the identities of fictional characters. Such characters derive partially from their own identities by making use of real or imagined memories, dreams, fears of the future, genuine impressions, and emotional responses to unexpected or even banal events. There is also music, with voice and instrumental accompaniment. The music slips between integration with the narrative voices and disjunction, between consistency and tension. At times it would direct the mood, and at other times it would disrupt. Despite that much of this material is made by others, it becomes, like the reality that is the raw material of an art photo, subsumed and transformed by the overall aesthetic act of the manner of its selection, distortion, organization, duration, and emotional effect. David Lean was fond of saying that a love story is most effective in a squalid visual environment. In Till Death Do Us Part, the squalor of the American desert violated by the detritus of consumerism, cheap construction, and its unrelenting light, is so extreme that advertising clips have elevated it to an iconographic status that has become a convention. But unlike the boast of advertising’s scrupulous control of the image in the service of a product, Stefanie Schneider’s work repudiates such control by means of an intentional imposition of accident. Since her source images derive from a degraded Polaroid film stock long past its expiration date—these images are then reprocessed and enlarged on analog equipment—the presence of the distortions in the images are intended by the artist who chooses the stock precisely for its capacity to distort, but the nature of the distortions, within the range of what the film stock in operation by the artist can generate, remain accidental and only visible to the artist for selection after the fact. Besides that such images evoke a tension between accident and control that is alien to commercial images that must be controlled due to the contractual nature of their origins and aims, it is a fact that the way accident underlies these images, does not derive from “what is already there” in, the conventional sense that photographs are constrained by the way they necessarily capture existing reality external to the artist’s contrivance. Here the accident is in the intrinsic process: it is chemical, physical, mechanical, and concealed from the artist’s view, as much as the artist does contrive the conditions for it to occur. In this sense, it perverts this traditional limitation of photography as an artistic medium by exaggerating it to an extreme degree. It transfers the lack of an artist’s contrivance, from the a priori nature of that which is photographed, to a chaotic element in the mechanico-chemical process of reproduction. This intentional imposition of accident reveals a marked precedent in the Abstract Expressionist painting of the mid-20th Century. The great figures of Abstract Expressionism all devised a way of applying pigment by means of a technique that incorporated a degree of accident into the process. It is this theoretical feature derived from practice that most effectively unites their work its conceptual aspect, despite the overt formal dissimilarity between the works. Pollock dripped and flung pigment, but mostly did not actually touch his brush to the canvas; de Kooning squeezed pigment onto the canvas directly from the tube, and scraped it behind the blade of a putty knife where its application was concealed from his own view; Frankenthaler would bleed thinned paint onto an unprimed canvas whereby the precise form and extension of the interaction would be self-generated; and Bacon, in another world across the Atlantic, differed from Soutine not as much in form as in technique: he would not paint his distortions directly with a brush, but would smudge them with a rag or sponge so that the result was invisible until after the fact. The Minimalists who followed, rejected this sort of work as too “gestural,” too “representational,” and too “personal,” but, all too often they ignored or underestimated the power of the tension to be derived from this conceptual dimension of the work in its simultaneous accommodation of intention and accident—which, in either case they would have regarded as inimical to the absolute control they often fetishized as an alternative to traditional emotion. But it is precisely this intentional imposition of accident that Stefanie Schneider introduces to the photographic medium in the intrinsic manner of its rendering. In this sense, her work is radically distinct from a photography that is thoroughly “staged,” or merely altered after the fact, or “manipulated” in the reproduction process, or degraded on its surface, or for that matter which luckily captures an accidental event. Her work reveals a marked theoretical kinship with the work of painters of the forties and fifties, by appropriating or “selecting” their most pertinent conceptual innovation and adapting it for the photographic medium by devising a practical means to incorporate it in a medium that is itself mechanically and chemically mediated. Here, the desert in all its squalor, is neither entirely real, nor “hyper-real,” but a fictive environment generated by the artist’s contrivance through the imposition of accident upon the process of photographic representation. Stefanie Schneider’s desert is no more literally real than is the absence of any intrusion of the external world in Till Death Do Us Part. The characters seem to have no past or future apart from the immediate—one could say in this regard, hellish— all-present of their exclusive relationship, and the narrated allusions to events that may or may not be real in the imaginary plane the characters inhabit. Within the world of this visual and narrated fiction, there exists for them no opportunity for interaction with anyone but each other, either in person, or by electronic means. Instead, the artist selects all aspects of their condition, even though constituents of the totality of their condition may originate with the actors themselves. Similarly, the artist isolates them from all elements that would fall outside the exclusive domain of their relationship. In this sense, Till Death Do Us Part is not reality, but more than reality’s depiction can achieve through conventional means, it conveys a real sense of what it is like to be a protagonist of such a relationship, to be prey to the strange delusions that so often occur as part of the relationship’s intrinsic condition, the sense that, for the lovers, only they themselves exist, and they exist only for themselves and for each other. The fact that both lovers are women, on the one hand, underscores this exclusivity, and renders them more keenly and apparently reflections of each other. On the other hand, it implies a degree of overt harmony in the work’s formal aspect that itself generates an aesthetic counterpoint to the tension between intention and accident in the work’s conceptual aspect. The effaced death that ends the work reaffirms the sense of oscillation between reality and fantasy that permeates the work. In the end, it is as though the totality of both character’s passions were subsumed by the desert, the stage upon which the artist enacts every mental state Stefanie Schneider conjures. 29 PALMS, CA is the fourth book in the Pocket Polaroids Series. It features selected polaroid photographs by Stefanie Schneider from the ongoing feature film/ art piece 29 PALMS, CA that chronicles the dreams and fantasies of a group of individuals who live in a trailer community in the Californian desert. 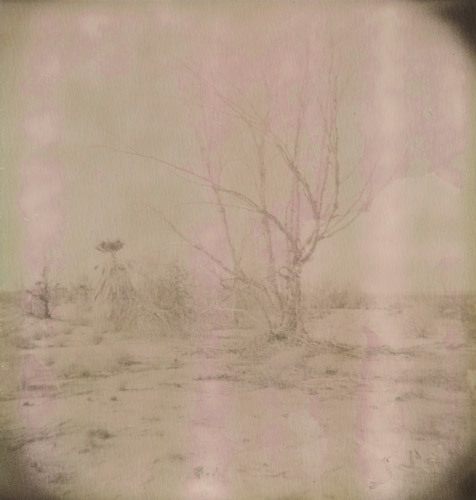 Her set-photography-like polaroids taken with expired material combine notions of reality and fantasy and explore the resonance of both within a desert landscape and a transient culture. text taken from the essay "Life's a Dream (The Personal World of Stefanie Schneider)" in "Stranger Than Paradise"
...in the series 29 Palms, CA (first begun in 1999) the two women characters Radha and Max act out a scenario that is both infantile and adolescent. Wearing brightly coloured fake wigs of yellow and orange, a parody of the blonde and the redhead, they are seemingly trailer park white trash possessing a sentimental and kitsch taste in clothes totally inappropriate to the locality. The fact that Schneider makes no judgment about this is an interesting adjunct. Indeed, the photographic projection of the images is such that the girls incline themselves to believe that they are both beautiful and desirous. However, unlike the predatory role of women in, say, Richard Prince's photographs, which are simply a projection of a male fantasy onto women, Radha and Max are self-contained in their vacuous if empty trailer and motel world of the swimming pool, nail polish, and childish water pistols. Within the photographic sequence Schneider includes herself, and acts as a punctum of disruption. Why is she standing in front of an Officers' Wives Club? Why is Schneider not similarly attired? Is there a proximity to an and focus of their identity? It is the ambiguity of personal involvement that is set up by Schneider which deliberately army camp, are these would-be Lolitas Rahda and Max wives or American marine groupies, and where is the center involvement that is set up by Schneider which deliberately makes problematic any clear sense of narrative construction. The strangely virulent colors of the bleached-out girls stand in marked contrast to Schneider's own anodynesense of self-image. Is she identifying with the contents or directing the scenario? With this series, perhaps,more than with any other, Schneider creates a feeling of a world that has some degree of symbolic order. For example the girls stand or squat by a dirt road, posing the question as to their sexual and personal status. Following the 29 Palms, CA series, Schneider will trust herself increasingly by diminishing the sense of a staged environment. The events to come will tell you both everything and nothing, reveal and obfuscate, point towards and simultaneously away from any clearly definable meaning. If for example we compare 29 Palms, CA to, say, Hitchhiker (2005), where the sexual contents are made overtly explicit, we do not find the same sense of simulated identity. It is the itinerant coming-together of two characters Daisy and Austen, who meet on the road and subsequently share a trailer together. Presented in a sequential DVD and still format, we become party to a would-be relationship of sorts. No information is given as to the background or social origins, or even any reasons as to why these two women should be attracted to each other. Is it acted out? Are they real life experiences? They are women who are sexually free in expressing themselves. But while the initial engagement with the subject is orchestrated by Schneider, and the edited outcome determined by the artist, beyond that we have little information with which to construct a story. The events are commonplace, edgy and uncertain, but the viewer is left to decide as to what they might mean as a narrative.The disaggregated emotions of the work are made evident, the game or role-playing, the transitory fantasies palpable, and yet at the same time everything is insubstantial and might fall apart at any moment. The characters relate but they do not present a relationship in any meaningful sense. Or, if they do, it is one driven by the coincidental juxtaposition of random emotions. Should there be an intended syntax it is one that has been stripped of the power to grammatically structure what is being experienced. And, this seems to be the central point of the work, the emptying-out not only of a particular American way oflife, but the suggestion that the grounds upon which it was once predicated are no longer possible. The photo-novel Hitchhiker is porous and the culture of the seventies which it might be said to homage is no longer sustainable. Not without coincidence, perhaps, the decade that was the last ubiquitous age of Polaroid film. In the numerous photographic series, some twenty or so, that occur between 29 Palms, CA and Hitchhiker, Schneider has immersed herself and scrutinized many aspects of suburban, peripheral, and scrubland America. Her characters, including herself, are never at the center of cultural affairs. Such eccentricities as they might possess are all derived from what could be called their adjacent status to the dominant culture of America. In fact her works are often sated with references to the sentimental sub-strata that underpin so much of American daily life. It is the same whether it is lower gardens and household accoutrements of her photo-series Suburbia (2004), or the transitional and environmental conditions depicted in The Last Picture Show (2005).The artist's use of sentimental song titles, often adapted to accompany individual images within a series by Schneider, show her awareness of America's close relationship between popular film and music. For example the song "Leaving on a Jet Plane," becomes Leaving in a Jet Plane as part of The Last Picture Show series, while the literalism of the plane in the sky is shown in one element of this diptych, but juxtaposed to a blonde-wigged figure first seen in 29 Palms, CA.This indicates that every potential narrative element is open to continual reallocation in what amounts to a story without end. And, the interchangeable nature of the images, like a dream, is the state of both a pictorial and affective flux that is the underlying theme pervading Schneider's photo-narratives. For dream is a site of yearning or longing, either to be with or without, a human pursuit of a restless but uncertain alternative to our daily reality. The scenarios that Schneider sets up nonetheless have to be initiated by the artist.This might be best understood by looking at her three recent DVD sequenced photo-novels, Renee's Dream and Sidewinder (2005).We have already considered the other called Hitchhiker. In the case of Sidewinder the scenario was created by internet where she met J.D. Rudometkim, an ex-theologian, who agreed to her idea to live with her for five weeks in the scrubland desert environment of Southern California. The dynamics and unfolding of their relationship, both sexually and emotionally, became the primary subject matter of this series of photographs. The relative isolation and their close proximity, the interactive tensions, conflicts and submissions, are thus recorded to reveal the day-to-day evolution of their relationship.That a time limit was set on this relation-based experiment was not the least important aspect of the project. The text and music accompanying the DVD were written by the American Rudometkin, who speaks poetically of "Torn Stevie. Scars from the weapon to her toes an accidental act of God her father said. On Vaness at California." The mix of hip reverie and fantasy-based language of his text, echoes the chaotic unfolding of their daily life in this period, and is evident in the almost sun-bleached Polaroid images like Whiskey Dance, where the two abandon themselves to the frenetic circumstances of the moment. Thus Sidewinder, a euphemism for both a missile and a rattlesnake, hints at the libidinal and emotional dangers that were risked by Schneider and Rudometkin. Perhaps, more than any other of her photo-novels it was the most spontaneous and immediate, since Schneider's direct participation mitigated against and narrowed down the space between her life and the art work. The explicit and direct character of their relationship at this time, opens up the question as to the biographical role Schneider plays in all her work. She both makes and directs the work while simultaneously dwelling within the artistic processes as they unfold. Hence she is both author and character, conceiving the frame within which things will take place, and yet still subject to the same unpredictable outcomes that emerge in the process. In Renee's Dream, issues of role reversal take place as the cowgirl on her horse undermines the male stereotype of Richard Prince's "Marlboro Country." This photo-work along with several others by Schneider, continue to undermine the focus of the male gaze, for her women are increasingly autonomous and subversive. If the whisky dance he asks her to is far enough away. Go. There is no music there. If they are high enough to hear, everything gets still as broken glass. And the car, it's like it drove itself out. So quiet as Stevie passed the bottle off and everything begins to fade. He says that they are far enough away now, yeah? And it's just the way it was. The light like this. An old guitar. Like no stranger was saying how far you could not go. Look there. We could park the Cadillac out behind that shed where nobody can see. We'll play stupid games, and it gets hazy now 'til nobody can recall if Stevie ever meant to stay as beautiful as then. They challenge the male role of sexual predator, often taking the lead and undermining masculine role play, trading on male fears that their desires can be so easily attained. That she does this by working through archetypal male conventions of American culture, is not the least of the accomplishments in her work. What we are confronted with frequently is an idyll turned sour, the filmic cliches that Hollywood and American television dramas have promoted for fifty years. The citing of this in the Romantic West, where so many of the male cliches were generated, only adds to the diminishing sense of substance once attributed to these iconic American fabrications. And, that she is able to do this through photographic images rather than film, undercuts the dominance espoused by time-based film. Film feigns to be seamless though we know it is not. Film operates with a story board and setting in which scenes are elaborately arranged and preplanned. Schneider has thus been able to generate a genre of fragmentary events, the assemblage of a story without a storyboard. But these post-narratological stories require another component, and that component is the viewer who must bring his own interpretation as to what is taking place. If this can be considered the upside of her work, the downside is that she never positions herself by giving a personal opinion as to the events that are taking place in her photographs. But, perhaps, this is nothing more than her use of the operation of chance dictates.